It has been argued that the increasing choice in media outlets would dilute the agenda setting power of traditional news media. The assumption was put to the test by Monika Djerf-Pierre and Adam Shehata, both of University of Gothenburg (Dr. Djerf-Pierre is also affiliated with Monash University). The authors conducted a longitudinal analysis of Swedish newspapers’ agenda setting power from 1992 to 2014. A representative sample of the Swedish population has been surveyed annually since 1986. One of the survey items asks the respondents to identify the most important issues of the day. Djerf-Pierre and Shehata compared this data from 1992-2014 to the articles published during the same time by Sweden’s five leading newspapers. 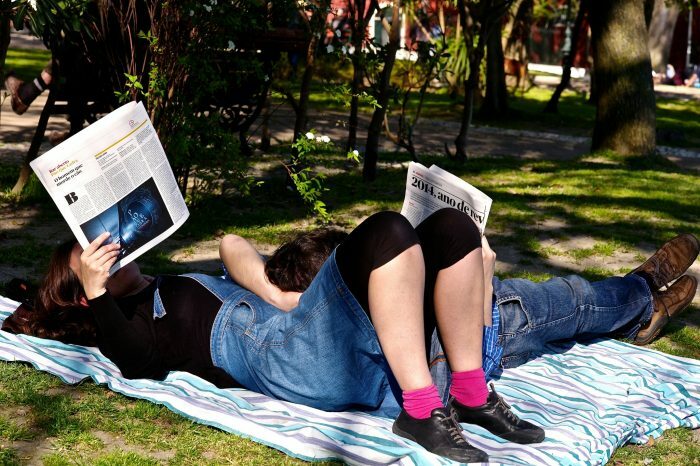 In addition to the newspapers’ combined agenda, the authors compared the Swedes’ opinion to the agenda of the country’s single leading newspaper, Dagens Nyheter. Contrary to the authors’ hypothesis, the newspapers’ agenda and the public’s issue salience continued to correlate throughout the years. On the other hand, the agenda setting power of Dagens Nyheter appears to have waned over time, although the latter result is not conclusive, Djerf-Pierre and Shehata note. The article “Still an Agenda Setter” was published by the Journal of Communication. It is available online on the publisher’s website (abstract free). Picture: Reading the newspaper in a Saturday afternoon by Pedro Ribeiro Simões, licence CC BY 2.0.